Since 1941, Aquaman’s been a perennial mainstay in comics. Granted, the Sea King hasn’t always been treated with the most respect. 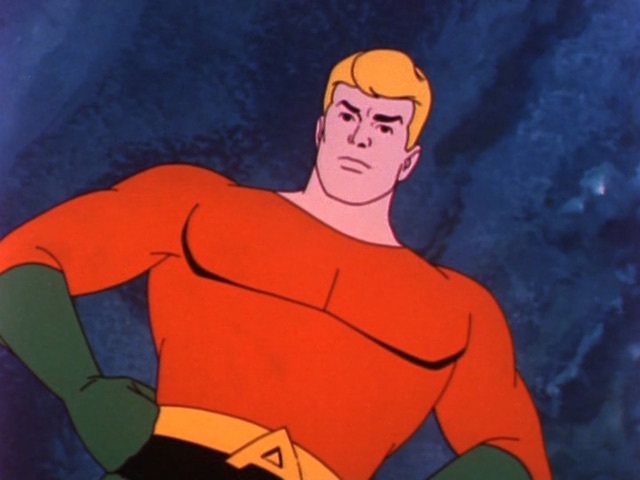 Still, thanks to various cartoons, his Justice League of America membership, etc., the King of the Seven Seas is referenced quite often in media, including other cartoons. Below is a list of some noteworthy references. The fifth season episode “Johnny of the Deep” shows Johnny and Dukey are fans of the old TV show “Aquadude.” Johnny thinks it’d be cool to live underwater and have Aquadude’s powers. Johnny gets his wish later in the episode when the twins turn the boys into sharks. This is so they can retrieve a device of Bling-Bling Boy’s from the ocean floor. While underwater, Johnny and Dukey meet the now-retired Aquadude in his underwater lair. When asked, Aquadude says his superhero days are behind him and he’s retired. However, he later changes his mind and decides to help the boys save the day. The episode ends with Johnny, Dukey, and Aquadude water-skiing together. Aquadude possesses Aquaman’s powers, down to throwing hard water balls like Arthur did in his 60s Filmation cartoon. Bikini Bottom superheroes Mermaid Man and Barnacle Boy are longtime secondary characters in the series. The duo resemble Aquaman and the Silver Age Aqualad in appearance/powers, but also Batman and Robin (specifically the 60s TV show versions). The other shtick is that both heroes are elderly and live in a retirement home. Despite this, they’re still pestered by SpongeBob and Patrick, the biggest fans of the duo. Mermaid Man’s debut episode shows he has a TV show resembling the 60s Aquaman cartoon, right down to the opening sequence. DC Comics’ multiverse contains the parallel world of Earth-C-Minus, an Earth that’s a funny animal version of Earth-1. As such, it’s the home of the “Just’a Lotta Animals,” its top superhero team. Said team includes Super-Squirrel and the Batmouse, as well as Aquaduck. He possesses all of Aquaman’s powers, including telepathy. Since all animals (including sea creatures) on Earth-C-Minus can talk, I’d wonder if Aquaduck’s telepathy puts the Sea (Duck) King more in the territory of the Martian Anteater (their version of J’onn J’onzz). Related to the Zoo Crew, the “JLA” and Aquaduck were considered fictional characters written and drawn by Rodney “Captain Carrot” Rabbit for Earth-C’s DC Comics. “Fictional” until the JLA and Zoo Crew met, anyway. The fourth season episode “Power Pals!” sees Timmy wish for a replacement set of “super friends.” Said friends are parodies of the Super Friends themselves, including “Wet Willie,” the Aquaman analog. Wet Willie has the ability to drop whales (out of nowhere) on others, which unfortunately includes Timmy. Another episode shows Bart reading “Aquaman and Superman,” presumably a “Simpsons” universe team-up comic with the two heroes. It’s meant to be a pun (Lisa in the same scene reads Shaw’s “Man and Superman”) and a joke about Bart’s less-cerebral interests. That said, the Sea King and Man of Steel have had a very long relationship together in comics. Aquaman appeared as a backup character in “Adventure Comics” (a title headlined by Superboy) from the late 40s through the early 60s. The Sea King also started making frequent appearances in the Superman books of the late 50s and early 60s.